Albert Finney's presence in Skyfall is mysterious for plenty of reasons, and actually took me by surprise when I saw it. Yes, his name was in the trailer and he was part of the casting announcements, but by the time he appears in the movie, you half expect the thing to have ended by then. But no, there he is, the groundskeeper as the ancestral Bond home, grizzled and badass in a way that more than a few people have speculated meant the role was originally intended as a cameo for Sean Connery. By now it's definitely not a spoiler to talk about Finney's role in the film, but back when the film was coming out last November, it might have been. That's the only reason I can think of, at least, for Sony to have scrapped Finney's character poster, which just emerged over at Empire. Take a look below. 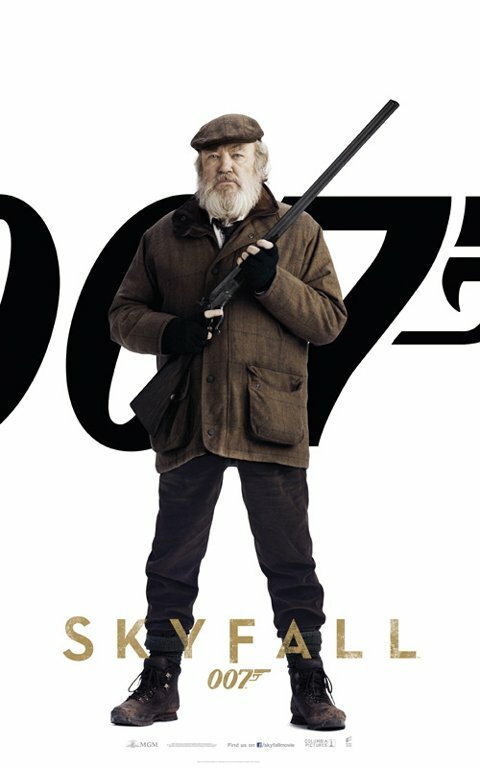 Given that the character posters for Daniel Craig, Javier Bardem and Naomie Harris all had them posing with sleek little guns, it's very right that Finney's groundskeeper be posing proudly with his rifle, which he uses to defend the Skyfall manor just as well as Bond might use one of his fancy toys. With the Skyfall Blu-ray set for release February 12, we are due to start seeing plenty more for the movie that didn't quite make the original theatrical cut. Anything in particular you're looking forward to learning when the Blu-ray makes its way out?